(Nanowerk News) Chemists truly went back to the drawing board to develop new X-shaped organic building blocks that can be linked together by metal ions to form an Archimedean cuboctahedron. In the journal Angewandte Chemie ("Precise Molecular Fission and Fusion: Quantitative Self-Assembly and Chemistry of a Metallo-Cuboctahedron"), the scientists report that by changing the concentration or using different counterions, the cuboctahedron can be reversibly split into two octahedra—an interesting new type of fusion–fission switching process. Archimedean polyhedra are a group of symmetrical solids with regular polygons for faces and equal angles at the vertices, like a classic soccer ball with its 12 pentagons and 20 hexagons. These forms are also found in nature: the rigid shells (capsids) of many viruses, as well as certain cellular transport vesicles are also Archimedean polyhedra. These biological forms are made by the self-assembly of individual protein building blocks. Chemists have frequently turned to this concept for inspiration to synthesize large molecular cages held together by coordination bonds. A team headed by Chrys Wesdemiotis and George R. Newkome has now successfully produced an approximately 6 nm cuboctahedron out of organic molecules and metal ions. A cuboctahedron has a surface made of 8 triangles and 6 squares. The conceptual starting point was an X-shaped, organic building block, which, laid over the surface of a cuboctahedron, would give the correct angles between the edges, 60° and 90°. It should also be able to bind metal ions to hold everything together. 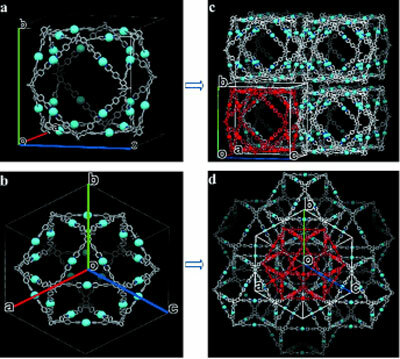 Using 12 of these tailored X-shaped terpyridine ligands and 24 metal ions (zinc or cadmium), the researchers were able to make cuboctahedra that self-assembled from the individual building blocks. The team from the University of Akron, the University of Chicago (Argonne), the University of South Florida (Tampa), Florida Atlantic University (Boca Raton), the University of Tokyo (Japan), and the Tianjin University of Technology (China) used a variety of spectroscopic techniques, model calculations, and single-crystal analyses with synchrotron X-ray diffraction to verify the structure. They were even able to see the shapes of the individual molecules with an electron microscope. One new feature they observed was that the cuboctahedra split apart into two octahedra when the concentration is reduced. If the solution concentration is then increased, the octahedra fuse back together into cuboctahedra. This process could also be initiated by switching between different counterions. This new process could allow for the production of a new series of nanoscale building blocks for the materials sciences. In addition, the zinc cuboctahedra may be suitable for use as transport systems for drugs.